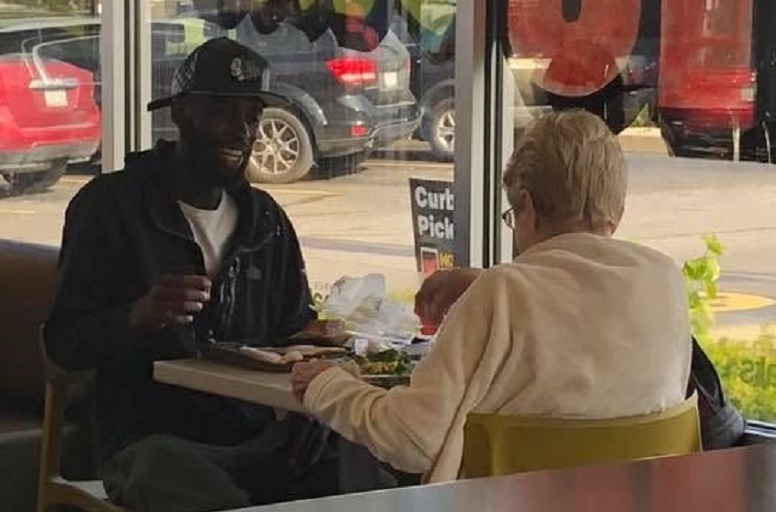 Eric Haralson was sitting down to a late breakfast on Thursday in Noblesville, Indiana, when he met a woman who would completely change the direction of his day. “I was eating breakfast by myself just catching up on the NBA games that I missed the night before and Jan Jessup, being the center of attention that I assume she has been all her life, sat at the table across from mine,” Haralson tells Yahoo Lifestyle. Originally, Jessup sat down with a group of teenagers because she was intrigued by one of their man buns. “She asked him about it and who helped him with that style because she has never seen it before and he responded with his mom, and then they exchanged a few words and she was off to get napkins,” he explains. That was the start of what the internet thinks is a beautiful friendship. “As I pushed the chair out for her, I reached out my hand and introduced myself and she extended hers and did the same,” he says. Haralson’s mom told him to never ask a woman’s age, so he didn’t but he guesses she’s between 60 and 70 years old.